The Coolpix P5100 appearance is one more cause for mfrs’ wild enthusiasm, not consumers’. Nikon right after Canon with G9, A650 put into P5100 model 1/1.72 inch sensor more than 12 mega pixels (for more look through Canon Powershot G9, SD950 and A650: can 12MP make SLR from compact). It is possible that after slightly disappointing P5000’s selling, Nikon solves this problem in style: more pixels and spit upon the image quality. However, this method cannot make from P5100 a cadet of D3 and D300 DSLR models. Are you impressed? I am not! I cannot see anything important in these features. Instead, I can see some useless but very expensive for a digital compact points, which serve only for drawing our money. See, how much garbage and noise can bring to the image 12 millions small and less sensitive to light pixels. As for lens, look at this: “a powerful, high-quality 3.5x Zoom-Nikkor lens, which delivers 36-126mm (35mm equivalent) performance for broad compositional freedom”. This is not about Nikon’s previous model P5000. It is Coolpix P1 greeting from 2005. All of Nikon P-series compacts have the same 3.5x lens. What is new? In addition, why does 3.5x zoom lens need the Lens shift Vibration Reduction? Maybe it is for drunken shooting. How should your hands shake for being in need of this feature? As for hight ISO images, in my opinion it’s only for terrifying bad guys. Not surprisingly, Nikon Coolpix P5000 is a better purchase for less money ($319-350). I doubt whether P5100’s key differences from P5000 can impress any prosumers. - Black border, it can be applied on taken images. Black border applied images can be saved with original images. Comparing Nikon P5100 and P5000 it is better to look at the Canon PowerShot A630. Although P5000 10 megapixels for the same P5100 sensor with the Lens-shift system for petty 3.5x zoom are an excess too. Nikon P5000 is a little preferable. It would be much better to have something such as P1 with 8MP 1/1.8 inch sensor, 4x zoom lens with a not poor case for $250-270. Unfortunately, we can see this model only between Canon Powershot A-series compacts. Moreover, it’s not a new model such as A650 or especially G9 and SD950 with the same 12 extra pixels. It’s simple and not expensive 2006 model – the Powershot A630. It may be not so prestigious to shoot with Canon A630 as G9, P5100 or P5000. However, it is a truly Compact with a good image quality for fair money. As for prestige, it should be better to buy Canon’s Tele or Wide-angle converters for saving money and having fun. It is interesting that the same story take place with SLR-like cameras. However, there are ultra zoom races instead of mega pixels fights. 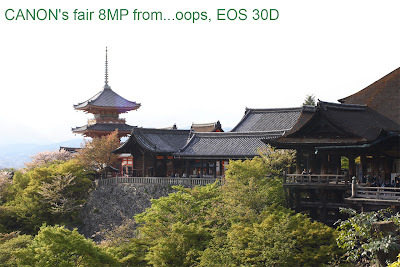 For more details look through: Olympus SP-560 vs SP-550; 18x SLR-like with E410’ processor and 826mm Tele converter and Compare Fujifilm S8000, Olympus SP550, Panasonic FZ18 - nothing to S9100. Which camera is the best: The Nikon P5100 or the Canon G9? Which one has the best quality pictures, but which one has the best effects, which one is more preferable as a gift for young man (22)? Please tell me which I should get. These two are the same digital cameras with a similar picture quality. It's better to know, which brand is preferable for your friend -- Canon or Nikon. Nice site and I'm trying to adapt an FC-E8 lens to my P5100. Do you know of an adpater to make this happen or should I be looking for a P5000 that nikon says the UR-E6 will screw on. Nikon was of little help on the phone. I used the UR-E8 for connecting a Fish-eye to my Nikon 8700, but I cannot use it with similar 8800. I think that in your case it's better to visit a good photo store, because the NikonUSA says that for the P5100 you can use only the UR-E20 Adapter Ring for the WC-E67 Wide-Angle Converter Lens. In response to fototramp's response to Kandy. 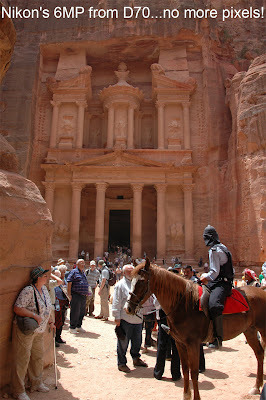 To say that the Nikon 5100 and the Canon G9 are comparable is to hugely gloss over lots and lots of issues. The G9 is a obviously superior camera, as is noted by just about everyone out there. If the person just needs a point and shoot to travel light, then the Nikon may be fine, but if they're serious about taking publication quality photos then the RAW of the G9 is a must. Also, the G9 handles just about everything better than the 5100. If you want to waste your money the Canon G9 is a really better choice. However, for 'publication quality photos' you need not only the RAW format from a small sensor with extra pixels.